Larian's massive, liberating RPG is a gift to fans of the genre. 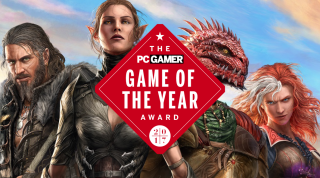 Divinity: Original Sin 2 is PC Gamer's overall Game of the Year for 2017, as voted for by our global editorial team. The following commentary comes from the game's biggest supporters on staff. Look out for the rest of our awards and staff personal picks at our GOTY hub as we head towards the end of December. Phil Savage: Was there ever any doubt? Divinity: Original Sin 2 was the obvious Game of the Year choice. It's a massive, sprawling RPG for one thing. But more than that, it embraces the chaotic, player-driven nature of all of PC Gamer's GOTY picks for the last few years. Original Sin 2's element-focused combat system is a revelation, giving you scope for wildly inventive, unpredictable solutions. Its fights are a test of wit, and often result in bewildering chain reactions. Whether you're electrifying someone's blood, or combining spells to kill a boss by doing an absurd amount of damage to yourself, experimentation is not only allowed, but rewarded. Steven Messner: It’s hard to overstate just how robust the combat is in Original Sin 2 and how beautifully it weaves into your personal power fantasy. By act two, my melee tank healed himself by standing in the blood of his enemies, a tactic so ruthless that I was cackling with each drop of blood that was spilled. That’s just one of the dastardly tactics I use to my advantage. My rogue uses a spell that inflicts bleeding damage with each step an enemy takes and then turns them into literal chickens that flee combat. With dozens and dozens of combinations like these just waiting to be discovered, Original Sin 2 is like a theory crafter's dream come true. There's never been an RPG with a story or characters this interesting that you can play co-op with four players. Joe Donnelly: It took me a full ten hours to leave Divinity: Original Sin 2's opening area. In that time I murdered a man, lied to his grieving daughter to obtain a key item, learned how to teleport, got double crossed, and pissed everyone else off I spoke to. It's so big and so much fun. After a solid 30 minutes of deliberation I chose to play as Beast, a dwarf who is the former leader of a failed rebellion, who is also a pirate captain with an emotional attachment to his bicorne hat, who is named Fran. Every one of the origin characters is just as layered, and thank god you can take three of them with you as companions so that I didn't have to leave behind the bard possessed by a demon, or the exiled prince who is also a big red lizard, or Fane. It's a long game that's hard to finish even once, and yet during every conversation with a ghost chicken or fight where I caught fire again, I was wondering how my next character would handle it. Tyler Wilde: Jody's right. I somewhat regret my custom character, but the good news is that outside of inner-party chatter, you can play Original Sin 2 'as' one of the origin characters, simply by initiating dialogue with them instead of with your character. I love Fane, an ancient undead fellow who's trying to figure out what happened to his kind, and who regards the fleshy inhabitants of the world as mundane and mostly useless, interesting only in the way they resemble his skeleton race (except with a bunch of unnecessary organs and gross skin). My favorite thing about Original Sin 2, though, is that it shipped with extensive mod tools. The whole engine is available. You can create levels, script NPCs, add items and spells. You could build Original Sin 3 if you wanted to. They're kind of buggy (as of right now, I have a really hard time rotating the camera) but hopefully future updates will help. Wes Fenlon: Straight up: there's never been an RPG with a story or characters this interesting that you can play co-op with four players. Divinity executes on this promise so flawlessly it just feels natural. Of course you can listen in to conversations your friends are having to follow the story. Of course you can all wander around a massive map, seamlessly looting and questing and shopping and fighting. Of course combat becomes a glorious mess of saving each other with cool abilities and accidentally nuking each other in equal measure. Divinity just wouldn't be the best co-op RPG ever made if you couldn't. I played my entire run of D:OS2 with a pair of friends, and it really changed how we perceived the adventure, and especially our characters. Solo, I'd be controlling an entire party, following their stories and weighing the experience of the group above all. But we're all invested in our own stories. Lohse is my character, and I care about the resolution of her battle with an inner demon more than I care about Beast's vendetta against the dwarven crown. I also like that I don't see and do everything my friends do when we're apart. There's so much mystery left in the world, and I know that next time I play, whether I'm controlling a whole party or simply a different character, it'll practically be a whole new journey. For more Divinity: Original Sin 2 coverage, check out our review and our best stories from playing the game.